Back in September 2014, Paramount Pictures made a bold move by announcing two sequels for Terminator Genisys, several months before the original movie even hit theaters. The studio set a May 19 2017 release date for Terminator Genisys 2, with a June 29, 2018 release set for Terminator Genisys 3, but given the disappointing box office take of Terminator Genisys, many wondered whether these sequels would even see the light of day. Variety is reporting that Terminator Genisys 2 has lost its release date, with the studio handing the May 19, 2017 release date to their upcoming Baywatch remake. Variety also mentions that the trilogy as a whole may not happen, but ERC Box Office claims that the movie is now simply listed as "To Be Announced (TBA)." The site's Twitter feed says that, if the studio was truly pulling the plug on the entire trilogy, they would have said the sequel was completely pulled from the release calendar, so there may still be hope for the sequels yet. The studio didn't move the June 29, 2018 date for Terminator Genisys 3 either, so it's possible these sequels may still happen. 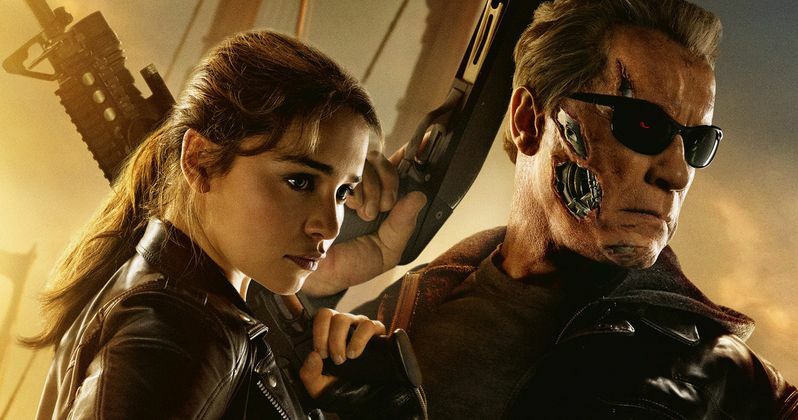 Back in October, we reported that Terminator Genisys 2 was "indefinitely delayed," and just a few days later, Skydance's Dana Goldberg said the sequels weren't exactly "on hold," but that the studio was 're-adjusting" their plans. Even if Skydance and Paramount do plan to go into production on these sequels, the clock is ticking, because they will lose the rights in just under three years. The rights to the entire Terminator franchise will revert back to director James Cameron in 2019, 35 years after his 1984 classic The Terminator was released. This is likely why the studio set 2017 and 2018 release dates for Terminator Genisys 2 and Terminator Genisys 3. It isn't known if the director has any plans to revisit the franchise after the rights revert back to him, but he'll certainly be busy in the meantime. The filmmaker starts production on his Avatar sequels later this year, with Avatar 2, Avatar 3 and Avatar 4 set for release in 2017, 2018 and 2019, respectively. Terminator Genisys took in just $89 million domestically during its theatrical run this summer, but it did fare much better in international markets with $350.8 million for a worldwide box office total of $440.6 million. Still, the movie did cost $155 million to produce, so it's possible that Paramount may just be cutting its losses and washing its hands of the entire franchise. Are you disappointed that Terminator franchise may finally be dead?